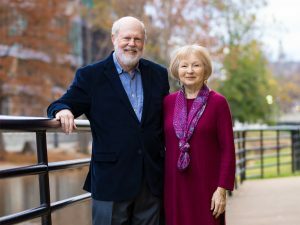 When Paul Jones (CIT’ 64) was a student at Case Institute of Technology, he worked in the labs of chemistry professors John Fackler, Jr., and Louis Gordon. That experience, he says, “was the thing that really got me committed to science, research and the PhD path.” Paul went on to pursue a doctorate at Purdue University and a career with P&G, where he retired as vice president for research and development in 1998. Three years ago, Paul began making annual donations to SOURCE (Support of Undergraduate Research and Creative Endeavors) at Case Western Reserve so that a new generation of students could benefit from the kind of opportunity he enjoyed. 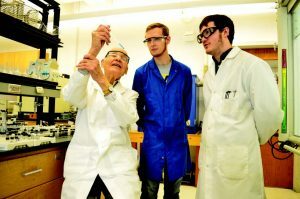 One of these students, Tyler Watkins (CWR ‘17), worked with Malcolm Kenney, the Hurlbut Professor of Chemistry, and graduate student Benjamin Sturtz to analyze the crystal structure of an N-capped silicon phthalocyanine, a molecule that may display never-before-seen efficiency in solar cells. With support from Paul and Marilyn Jones (top), Tyler Watkins (below, center) pursued an undergraduate research project under the guidance of Professor Malcolm Kenney and graduate student Benjamin Sturz. To ensure that this support will continue, Paul and his wife, Marilyn, have now established an endowed undergraduate research fund. Legislation passed last year allowed them to draw from their individual retirement account (IRA) for this purpose without incurring a federal tax burden. “I am so grateful to have been able to participate in the SOURCE program through Dr. Jones’ support,” Tyler says. To discuss a donation from your IRA or learn how your philanthropy can have an impact, please contact: Clarke Leslie, associate dean for development and external relations, at 216.368.5322 or clarke.leslie@cwru.edu.